This popular spice used in ginger ale is a remedy for upset stomachs and nausea. Chewing ginger or enjoying it in a ginger tea is also a common home remedy for nausea and used by many cancer patients. This popular spice is consumed in varying amounts worldwide in food and beverage products. It has proven more effective against cancer than cancer drugs which have actually been shown to accelerate the disease in cancer patients. This popular cancer fighting spice has been used as a food product by many different cultures worldwide for centuries. Ginger provides our bodies with a rich source of antioxidants…those warriors that fight off free radicals. Because it contains certain vallinoids… paradols and ginerols and other contituents… shogoals and zingerone…all active ingredients towards reducing pain, it has analgesic properties similar to ibuprofen and is one of the best pain killers in the world. 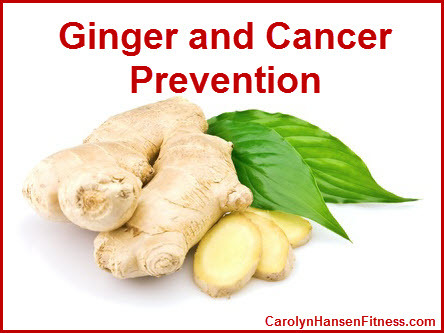 Research done on mice that had tumors revealed that ginger acts to kill cancer cells two different ways. Apoptosis: Because the anti-inflammatory properties of ginger are so strong, it prevents precancerous tumors from creating the ideal breeding ground for growth. Cells actually destroy themselves but leave surrounding cells untouched and healthy. Autophagy: Ginger plays the magician role and actually tricks cancer cells into eating and destroying themselves. As part of the Zingiberaceae family along with turmeric and cardamom, ginger can be consumed fresh, dried as a spice, powdered, in oil form or as juice. It’s the perfect condiment to flavor foods and drinks without adding any extra sodium. Normally used in small amounts it does not account for any significant quantities of carbohydrates, protein, fiber or calories. You can pair it up easily with seafood, melons, pork, apples, and squashes. Ginger is one of those spices that crosses over from main meals to desserts. You’ll find it used in many different kinds of “ginger” cookies and baked goods. Natural ginger has proven safe for nearly everyone with little to no known side effect. When purchasing fresh ginger look for a root that is smooth with taut, wrinkle free skin and a nice spicy aroma. Store your freshly purchased ginger in the refrigerator or the freezer after wrapping tightly in plastic or sealing in a plastic bag. Adding a bit more ginger to your diet will not only boost your cancer fighting warriors, but there are other unexpected benefits to be gained from enjoying ginger. Knowledge is power…if you would like to find out if you have an invisible threat hanging over your head you can take my FREE “at risk for cancer” test today. Make today the day you turn your life and your health around. Empower yourself and take control.